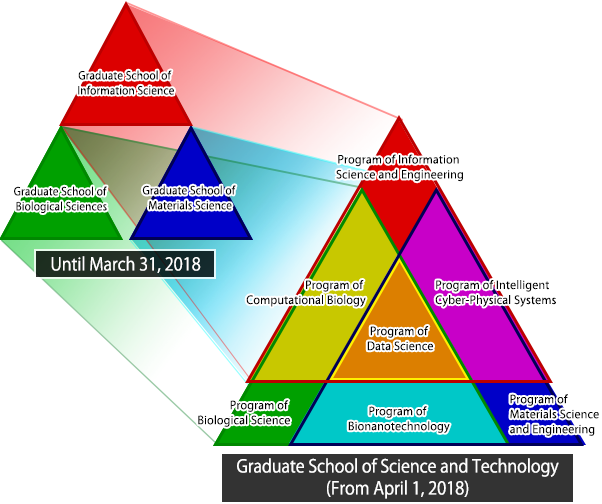 In the Graduate School of Science and Technology, seven new education programs will be established to allow for the furthering of specialized research in information, biological and materials sciences; pursuits in the interdisciplinary areas of information, biological and materials sciences; and interdisciplinary challenges in data science merging these areas. The current Graduate Schools of Information Science, Biological sciences and Materials Science will be unified to remove organizational barriers to respond to rapidly-advancing research developments at the forefronts of science and technology. 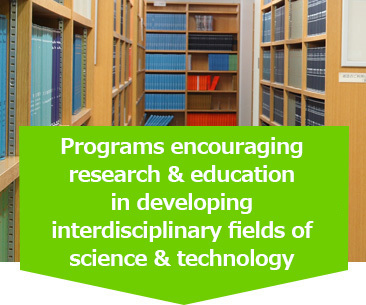 Apply for entrance to the research area you are interested in from information, biological and materials sciences. After entrance, choose a laboratory based on research area & education program. After laboratory placement, choose 1 program from the 7 education programs. *Eligible programs depend upon the laboratory to which you enter. There is a strong demand for education to develop human resources that will undertake interdisciplinary exploration and innovation in quick response to the rapid developments at the ever-evolving forefronts of science and technology. 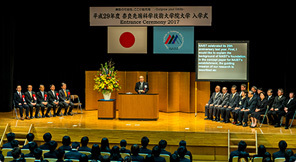 In new courses, students can obtain a wide range of knowledge from the specialization to its interdisciplinary developments and strengthen critical thinking, which will lead to increased career choices for graduates. Possible careers: communications, electronics, industrial chemistry, food manufacturing, pharmaceuticals, etc. Information on this homepage is updated regularly so we recommend checking relevant information regularly. Fosters students able to support today’s dynamic advanced information society, implementing further achievements in information science in diverse fields & their wide-spread application. This program enriches students’ broad interdisciplinary vision & cultivates cutting-edge specialized knowledge and skills covering computer hardware, software & information network technology; computer/human interaction & media technology; & various systems to fully utilize robotics & computer technology. Fosters students able to facilitate societal development & environmental protection through activities concerning areas such as the environment, energy, food supply, resources, life quality & health maintenance, within industry & public institutions foreign/domestic. 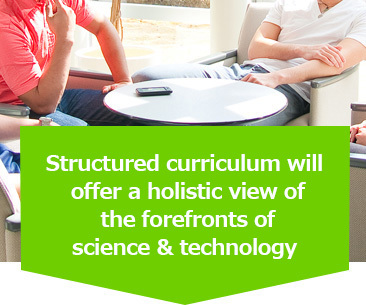 This program enhances students’ knowledge & cultivate expertise in areas from the basic principles of the phenomena of life to the biodiversity found at the molecular, cellular & individual level of plants, animals & microorganisms. Fosters students with the foundational knowledge of materials science & advanced knowledge to fully utilize their expertise through a program spanning solid state physics, device engineering, molecular chemistry, polymeric materials and bionano-engineering, & undertake next generation science & technology to maintain affluent living & support societal development. Fosters students who are able to collect & analyze the huge amounts of data related to the phenomena of life, such as medical imaging data & the enormous amounts of bio-information concerning genes, proteins, & metabolism, while fostering persons who will undertake the development of these technologies. 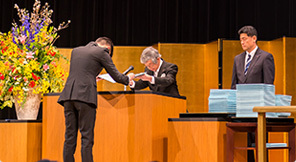 Fosters students able to holistically grasp areas including functional material design, devices with new functions & real-world sensing, analytical device design, system structuring to fully utilize analyzation results, & machine & robot control systems, who have specific, specialized knowledge & experience to support the social systems of this IoT era. Fosters students who pursue new trends in bioscience based on materials science understanding, & cultivates abilities necessary for the creation of novel functional materials to contribute to the future of society, including development of pharmaceuticals & medical engineering materials, development of new polymers which imitate biological functions, development of novel compounds to increase farming productivity, & exploration of new cellular engineering to support regenerative medicine through an understanding of the molecular foundation of biogenic activity. Fosters human resources with a wide range of expertise in data-driven & AI-driven sciences related to information, biological, & materials science who will find hidden ‘value’ & ‘truth’ through data processing, visualization, & analysis of huge amounts of collected data to contribute to next generation of science & technology, & societal development. PBL subjects will be established where students will fully apply their acquired knowledge and experience in teams composed of students from diverse specialized areas and academic backgrounds to promote problem-solving skills necessary for actual research and development in society and to foster cognitive abilities for issues in science and technology as they develop in industry and society.